This week, the question is from Lori Hilliard, editor of “The Contemporary Pet.” We’re ALL still learning and are happy to take advantage of our wonderful contributors to answer our pet behavior questions. This garden border fence is high enough to keep Soldier out while my smaller flowers take root. 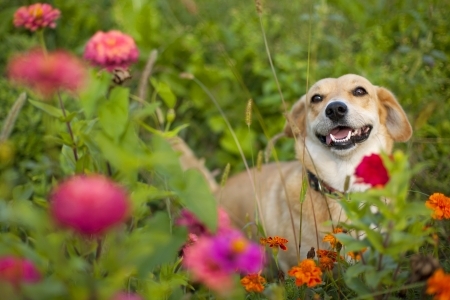 A note from Lori: I took Kristen’s advice and vigilantly monitored Soldier for a few days, making sure he always went to a grassy area of the yard instead of into my flower bed, but it wasn’t practical for a full thirty days. 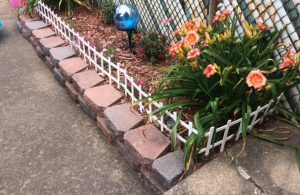 Kristen also suggested preventing access for thirty days, so I tried putting up a small border fence around the flower beds that is only about eight inches high. Soldier looks at it every day with disdain, but he won’t step over it. The border fencing has pickets across the top (like a miniature white picket fence) and he’s relatively low to the ground. I haven’t decided whether to leave the fence up for the duration of the summer, but for now it’s working, and that’s what counts!